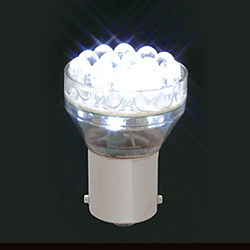 Manufacturer of LED Lamps and Bulbs For Home Decoration and Car led Lamps LED indicator light. Made up of twenty-four red super bright LED bulbs separated into two strata to increase illumination area; Suitable for various vehicles as direction light. 1. Part NO: T25-1156-24W. (1) Emitting color: super white. (2) Forward voltage unit (V): 13.2. (3) Totality luminous intensity unit (LM): 23.5 (4) Single LED axial intensity unit (mcd): 10800 (5) Dominant wavelength unit (nm): X:0.29; Y:0.28. (6) Viewing angle unit (deg): 15. (7) Color temperature unit (K˚): 8500. 2. Part NO: test condition. (1) Emitting color: power: 1.58W. (2) Forward voltage unit (V): current: 120mA. (3) Totality luminous intensity unit (LM): IF=20mA. (4) Single LED axial intensity unit (mcd): IF=20mA. (5) Dominant wavelength unit (nm): IF=20mA. (6) Viewing angle unit (deg): IF=20mA. (7) Color temperature unit (K˚): IF=20mA (IR max: 0.01mA; VR=5V). Super bright LED; shockproof, durable, long life with over 50,000 hours on average; Eco-label, saving energy; Fast active, pure color with nice appearance; IC controls the flash changes to give out various different flashing impact.